Glass is shiny and it glows with color and reflections of light. 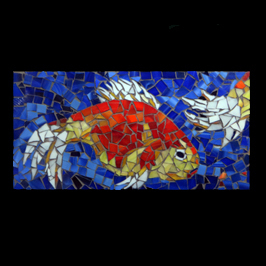 When people see a glass mosaic they are stopped in their tracks looking at the beauty of the glass. Enjoy this opportunity to create a truly unique masterpiece of a Goldfish! Sharon will guide you every step of the way as you learn to plan and complete your project.